> Maximizer > How long has it been since you improved your CRM? Even though businesses have their own set of individual characteristics and special requirements, one of the elements they have in common is the need for regular inspection and tune-up of their CRM. 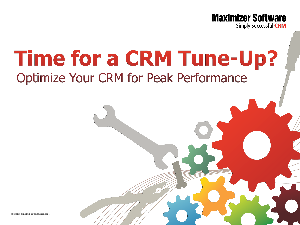 Download a complimentary copy of the "Time for a CRM tune-up?" e-book, with interactive checklists to help guide you in identifying opportunities and areas of improvement in your CRM. Rate your sales, marketing, customer service and business intelligence ability to find out where you should be focusing your tune-up efforts.